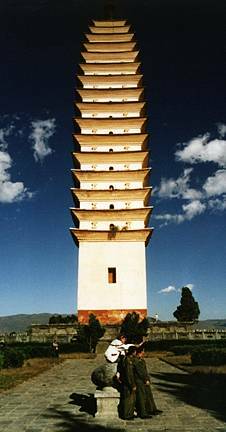 This is Qianxun Pagoda in Dali, Yunnan Province, China. It was built in the mid 9th century and is about 70 meters (230 ft) high. Some Chinese soldiers are getting their picture taken in front of it. 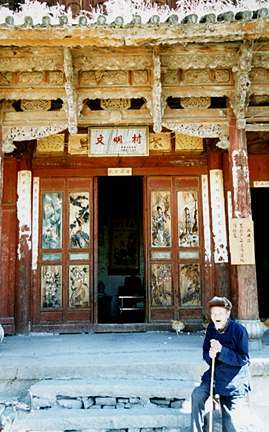 This temple is along the large lake near Dali and is dedicated to the Goddess that protects fisherman. This old man showed me around and pointed out all the old pictures of Communist Party rallies lining the walls. This is another temple about 20 km from Dali. I ran into it while bicycling along the lake. These women were singing and playing various sorts of instruments. They are dressed in the clothing traditional to their ethnic group, but I am not sure what it is. 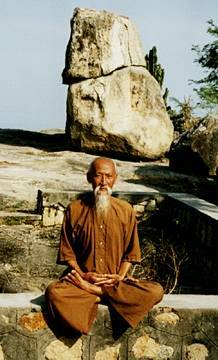 This old monk seemed to like to pose for the tourist at a hill top temple in Vietnam. The temple is located in the town of Chau Doc near the border with Cambodia in the Mekong Delta region. 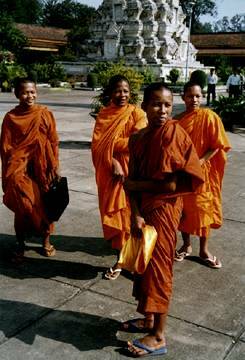 These monks were are at the Silver Pagoda in Phnom Penh. 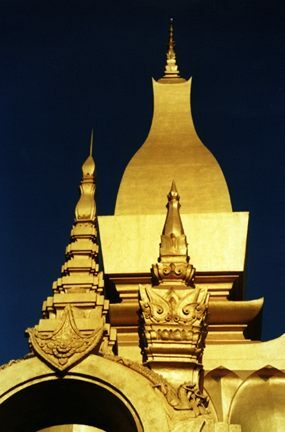 This is the main temple associated with the Royal Palace. This is Wat That Luang in Vientiane, the capital of Laos. 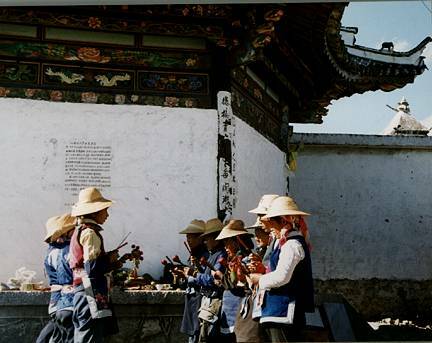 It is the most sacred temple in the country and its outline is the national emblem. It was first built in the 16th century, but has been reconstructed many times since. 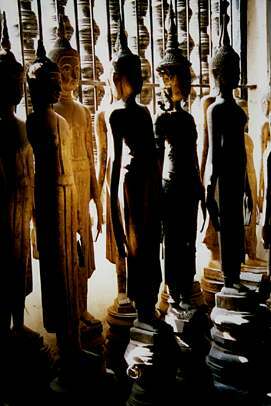 These old Buddha statues were lined up along a wall in a temple in Luang Prapang in northern Laos. The lighting looked very dramatic at the time, but the photo didn't come out as well as I hoped. 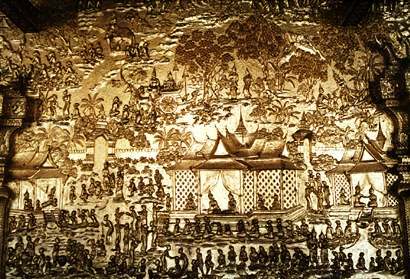 This relief was on a small shrine in Wat Xieng Thong in Luang Prabang. 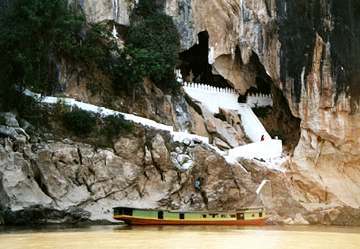 This is one of the Pak Ou Grottoes that lie above the Mekong about 25 km upriver from Luang Prabang. 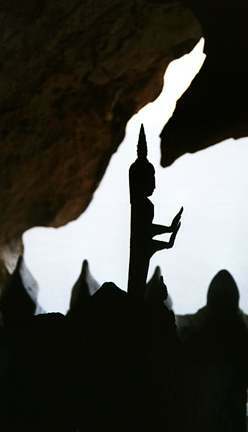 The next two pictures are from the interior of the cave. 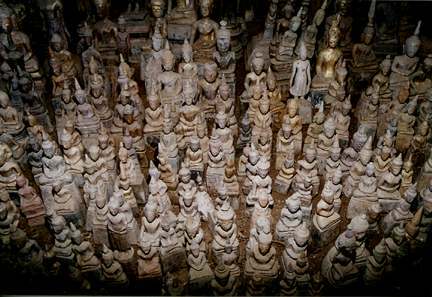 Inside the cave are thousands of small (above) and large (below) Buddha statues left by pilgrims. The posture of this Buddha statue is meant to signify doing no harm. 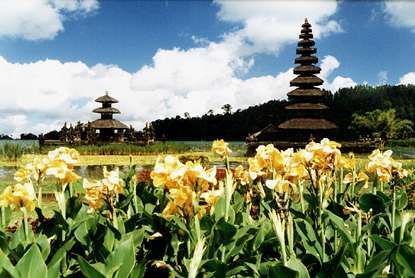 This temple, called Pura Ulu Danau, is along Lake Bratan in the central mountains of Bali in Indonesia. It is both Hindu and Buddhist.